Today I finally did what I wanted to do for soooo long! OMG! Whith work and christmastime my private plans turned outto be in CHAOS! Let`s start with Episode 15 for now then! Okay? Where die we leave off? SuYun was still locked up and JeongRyul was on his way to bring SeonWoo back. So SeonWoo went to pay Jeong DeokSu another visit and… >< … learned about something surprising. Later Section 9`s plans, and especially JeongRyul’s and JooMin’s plans, were put into action. 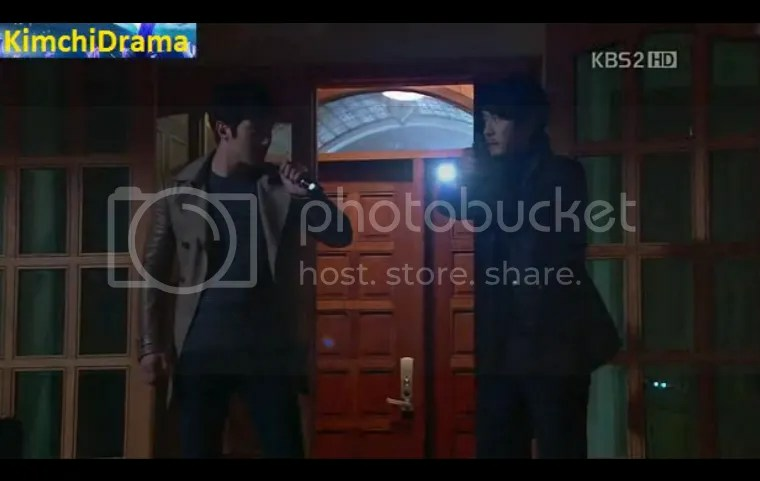 JooMin went to finally meet Cheo HuiGon and… GOT CAPTURED AS WELL… and he got shot! >< He was fully exposed as the spy and let`s kust say: Black Society was not amised. And since the rats always leaving the sinking ship… the gangsters, knowing that Section 9 is on their way with the SSAT, went away and left SuYun with half dead JooMin in the basement. It felt like… forever until they finally started to storm the house! …and of course SeonWoo & JeongRyul were the frist two inside the house. They finally found SuYun & JooMin in the basement. They already thought JooMin wouldn`t make it… ai, it was especially dramatic for JeongRyul because JooMin is his dear friend. In the end the ambulance came & left the rest of the team behind worrying. At the end of the episode we knew: there`s a rat among us! I dunno when I will finish the cap collection of the last episode. OMGZ! Pppl, please stop me from doing this ever again XD It ended so crazy! Never had so many screencaps of one of the previews episodes like I have not of the last one! They turned out to be 100 in the end. Maybe I will sort out some of them but I`m almost sure that I, even with pic collections like today, will be not able to show you all of it at once. Everyone, do you remember the pic JJ posted this week? 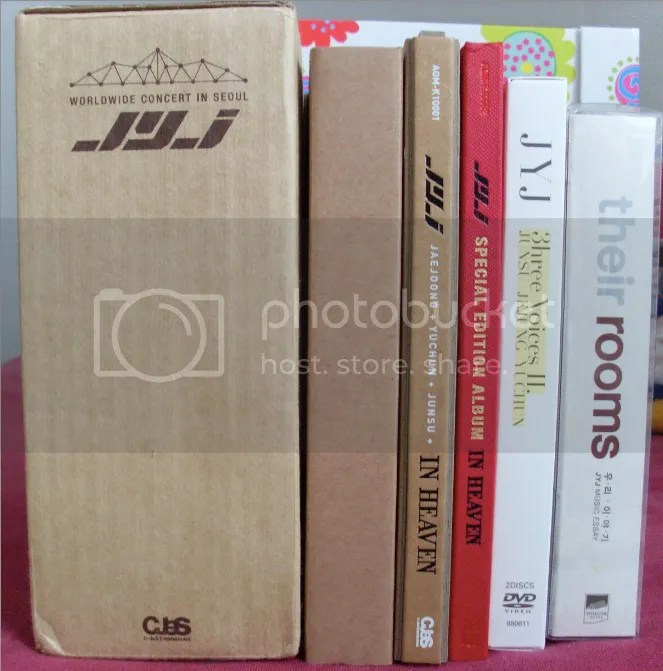 The one of his book shelf & all the JYJ things in it? btw: Did I ever tell you HOW FREAKIN’ PROUD I am that I have one of the 70 000 Special Editions of In Heaven?! … I cannot even! ➤ the JYJ video about them announcing their YouTube channel is now available with subs! JYJ HWAITING! ^^ GO CASSIES! oooh my heart! This was filmed from the area somewhere behind me! AWEEEESOME! This was such a… thrilling moment! The whole Tempodrom shouted this, from one side to the other. Some of us were really short of time. I mean I “rushed” to berlin and my schedule for the concert days was tough. I didn`t had the time to do anything else besides go ther and go home again. I had only one day of vacation and this was monday. concert was on sunday. I was still at work on friday. I travelt to Leipzig on SAturday early in the morning, spent some time with my best friend and then we went to berlin on sunday. concert-> we went to the station directly after it to go back to Leipzig and on monday morning I went to the station there to travel back home. I think it goes without saying that this little fear about “to be edited out/erased from the world map again because of not enough ppl in the venue” is in some heads. It`s not just in mine. Although SME expert said european market is worth more in future than China or Japan I don`t trust the whole situation a bit! But besides that: Every bigger venue go and cry! We were poor little number of 3000 fans, yes, that`s right. But in our venue, when you have your seats in the very last corner you can still see JYJ very well! And small venue feels more private than laaaarge venue. Nonetheless the concert in berlin made that weekend become the best weekend of my live! XD ah haha! Seungri sounded like he wants to hypnotise the fans! Nu, nu, nu! Seungri, you go and buy your ramen yourself! ^^ Since (normally) fans are women you have to treat them to a meal! 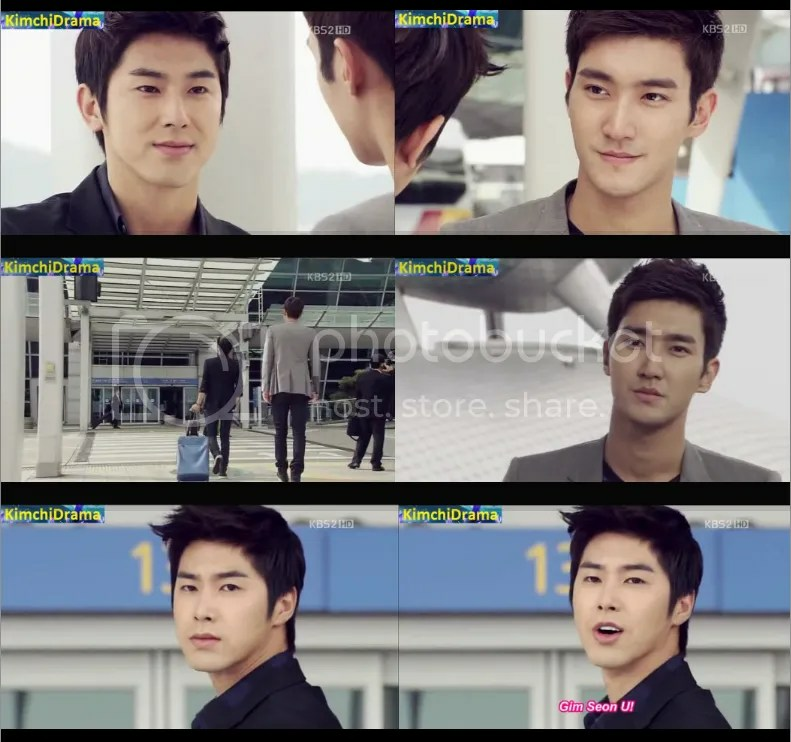 ➤ This was funny: The “hallyu madness” XD ah! It`s already a madness now! ㅋㅋㅋ excellent! ➤ THIS really made me laugh a lot today! When you listen to HanChul you always get the feeling they are a really heart warming and funny couple.❤ I love it! TVXQ: We will “go beyond our limit” at the unforgettable venue, Tokyo Dome! oh, you don`t know the shark story? You maybe know that JYJ spent their vacation on Hawaii last year. I talked with Emmy at that time and told her that I don`t want them to go swimming in the ocean because there are too many great white`s (sharks) around. well Emmy died laughing then but I was serious here! THAT`S NOT FUNNY! See ya the next time around! 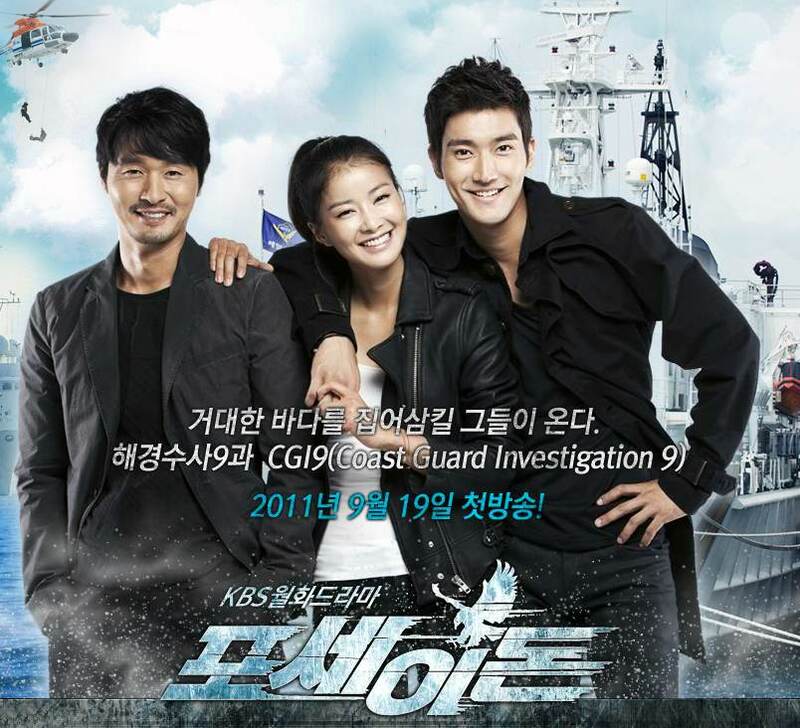 This entry was posted in All entries, Korean Dramas, Video Blog! ^^ and tagged #JYJinBerlin, Cassies, Chile, chilean cassiopeia, DBSK, Dong Bang Shin Ki, Episode 15, 韩庚, Han Geng, HanGeng, Hankyung, Heechul, Heenim, HoMin, 포세이돈, 한경, 한절, 에피소드15, 희님, 희철, JYJ in germany, k-pop, live tour japan, Poseidon, THSK, Tohoshinki, TONE tour, visit korea, YaShimManMan, YSMM. Bookmark the permalink.